Last month I did a local television interview with Lorene Mills, of REPORT FROM SANTA FE. Lorene has had a very eclectic guest list over the years. A lot of New Mexico politicians, to be sure, but also artists, writers, and even stranger types. 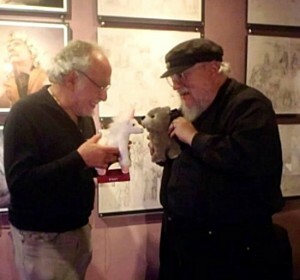 She's a big Peter S. Beagle fan as well, and interviewed him when he was here a few weeks back with THE LAST UNICORN. Awesome interview. Does it bother you that people consistently refer to the series as Game of Thrones? A Song of Ice and Fire people! It bothers me that the series is constantly referred to as Game of Thrones. Great interview though! That picture: Priceless! It makes me smile, you're both fantastic! I'm the illustrator of The Wit & Wisdom of Tyrion Lannister. I've just worked up a new image of GRRM. would anyone like to see it? yes, I'd like to see it. Two of my favorite authors, together. This makes my toes tingle.